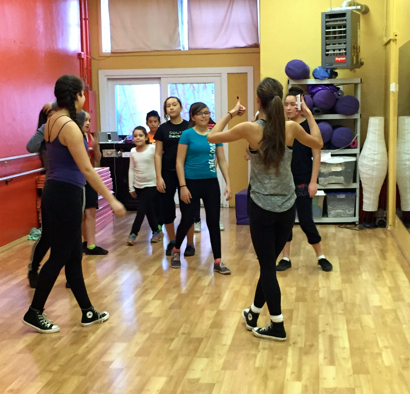 Lauren McLaughlin (pictured above, grey top) is a rising senior at Menlo-Atherton High School who is sharing her love for dance and years of experience with students from her local community. Her organization, A Chance to Dance, serves kids ages 10-17, primarily from lower income backgrounds and the Ravenswood School District. Lauren: I have been dancing since I was three-years-old. Now, I’m the captain of my high school dance team as well as my competition team. From 6th to 10th grade, I started and ran my own dance business, which served about 6-7 girls between the ages of 5-12. I definitely enjoyed it, but as someone always looking for the next step and to expand my impact on my community, I wanted to do something more. I started thinking about how I could use my passion for dance to help cultivate a similar passion in others. I love teaching, and I love dancing, so I quickly realized that I could combine the two by teaching free dance classes to kids who otherwise wouldn’t have the chance to dance. Paying for classes, costumes, competitions, and equipment makes dance a very expensive sport, so many kids don’t get to participate. However, I believe everyone should be given a chance to dance. The purpose of A Chance to Dance is to provide free, regular, ongoing dance classes for kids ages 10-17 from lower income families. Currently, there are three teachers, including myself. Each of us have over 10 years of dance experience. Justin: Wow, you started a business in the 6th grade! How did you do that? I had helped teach summer camps and dance classes at my studio, so I thought about it. Starting and running your own business isn’t that hard, right? Admittedly, it was much harder than I expected. I had to teach the class, track finances, coordinate costumes, plan the end-of-the-year show, and keep everything organized. It was quite a challenge, but it gave me valuable leadership experience that ultimately led to A Chance to Dance. Justin: How did you acquire funding for A Chance To Dance? Lauren: In October of my sophomore year, I came across the Tutor Corps’ Susan Lindquist Community Service Grant. After I came up with the idea of A Chance to Dance, I applied for the grant and won it! Then, I started a Kickstarter campaign, filmed a promotional video for it, and received enough money to start my project in January. All of this happened very fast, but it was so exciting. Justin: What’s the mission of A Chance to Dance? Lauren: The program has three goals. The first is to engage kids from lower income families who may not have many opportunities to play sports and exercise in rigorous physical activity. The second is to help them develop self efficacy, which includes helping the kids set personal goals, and then assisting them in achieving those goals by the end of the year. The third is to provide them with positive role models, through the teachers becoming mentors for the students. Justin: Do you have your own role model who you look up to? Lauren: My role model would be my dance teacher Nona [Ybarra]. One year, I had to interview her for a project, and I learned all about her story. Coming from a lower income background, she is someone who has paved her own path to her success and is a huge inspiration to me. Nona has been very supportive of me through this whole process and also lets me use her dance studio for A Chance to Dance! Justin: What do you love most about running A Chance to Dance? Lauren: The program runs from September to the end-of-the-year show in May. Usually the class starts off with about 15 people, with eight or nine girls who attend every week and are clearly passionate about dancing. I run the program for those eight or nine girls, because I get to see them grow as both dancers and individuals with every class. Justin: What kind of setbacks have you faced in your time working on A Chance to Dance? Lauren: A problem that we have faced, and still haven’t quite solved yet, is that many students who really want to attend our classes can’t attend due to their circumstances. For example, they might have other events on weekends, they might not be able to get rides to the classes, or their parents might not be motivated to support them. It’s hard for these kids to consistently attend, mostly because they and their families aren’t used to committing to the regular practices and meetings of sports and clubs. That’s why I believe it was a huge accomplishment to get those eight or nine kids to regularly attend nearly every class throughout the year. It helps them develop a habit of making commitments, which will greatly benefit them later in life. Justin: What’s the next step for A Chance to Dance? Lauren: I’m part of a national organization called the Boys and Girls Club, and currently I’m talking to one of their directors, as we’re both interested in integrating my program into the club. Currently, I am interning there to see how the organization works and interacting with the youth it serves to hopefully begin collaborating in the fall. Both of our programs have similar missions, so I’m excited to see where it goes! Justin: What advice would you give to high schoolers who are starting a similar project or a project in general? Lauren: First of all, it helps a lot if you write out your plan beforehand, because it helps you become organized and gives you direction for your project. For me, applying for the grant was helpful, because the application required a very specific project overview and timeline. I worked on it for an entire month, but once I had everything written out, my entire plan was laid out in front of me, and I knew exactly how to start and which steps to take. If your project requires funding, applying for different grants and starting a Kickstarter campaign are great ideas. They will also help you identify the potential problems and challenges of your project, and give you opportunities to brainstorm how to overcome them. Author of this post, Justin Duan, is a rising senior at Saint Francis High School in Mountain View, who serves as the editor-in-chief of the school newspaper. Currently, he is working on HSCanvas, an independent project he co-founded that conducts interviews with students around the Bay Area who are impacting their communities and pursuing their passions by starting their own independent projects. This post originally appeared on HSCanvas and is used with permission. I am inspired. I have a daughter who is 11. I will have her read what you said and hopefully she will get in touch with you.